Railway Recruitment Board (RRB) has released advertisement for the RRB ALP Jobs 2018.The notification released in the month of February 2018. 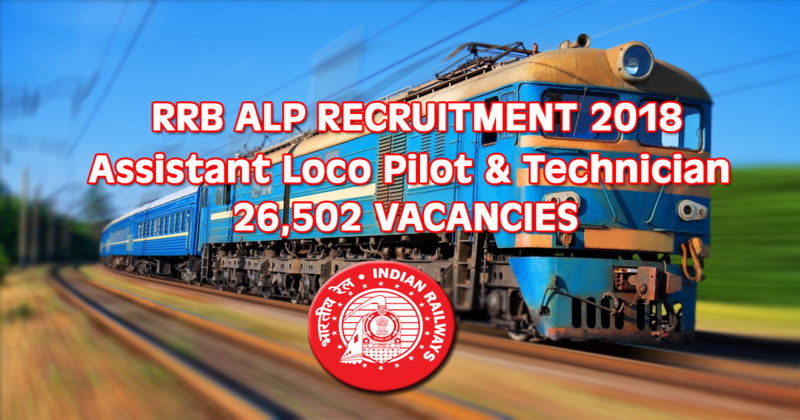 Approximate 26,502 posts of assistant loco pilot are vacant in the Railway. If you are preparing for the Railway Recruitment 2018 Exam then this opportunity is only for you. Now that the application forms have expired, the candidates are now waiting for the RRB ALP exam date and the admission form. The date of RRB ALP exam will be released soon on the official websites of RRB and the entry letter for RRB ALP examination will be released before 15 days of examination. It is advised that the candidates must check RRP ALP Application Status and take the printout of their Application Form for future reference purpose. Printout of the application form is required because it serves as a proof that you have successfully applied and submitted for the Railway Recruitment board ALP & Technician Recruitment 2018-2019. The printout of the Application Form is also required during the Document Verification. Interested and eligible candidates can apply for the post of RRB ALP & Technician. Ministry of Railways has given additional relaxation in Upper Age Limit for all categories by 2 years. All categories have increased age limit by 2 years. Online Applications are invited around 90,000 posts in Group C and Group D Posts. Group C Level I (Erstwhile Group D) include posts like Track maintainer, Gateman, Porter, Pointsman, Helper. Now Group C Level II categories include posts like Assistant Loco Pilots (ALP), Technicians (Blacksmith, Carpenter, Fitter, and Crane Driver). Now there is an option to take the exam in regional languages like Malayalam, Kannada, Telugu, Tamil, Odiya among other languages will also be available to the candidates. As per the latest information, Guys, so far about 2 crore applications have been filled up for the recruitment of 89,000 railway Jobs. Applicants have successfully made the fee payment for the RRB ALP Recruitment 2018-2019. So, if you are preparing to get into the Railway Jobs,then you have come to the right place. In this article, we will be providing you the complete details about the ALP Recruitment 2018. Latest Updates: RRB ALP and Technician 2018 Application Form Submission / Online Registration is Closed Now. Exam pattern plays a very important role for the preparation of exam, so here we are providing a fully described RRB NTPC 2018 Exam Pattern for the preparation. RRB NTPC Exam will be held in two stages that are Preliminary (1st Stage) and Mains (2nd Stage). ALP- Engineering Degree / Matriculation / SSLC plus ITI from recognized institutions of NCVT/SCVT in relevant trade. Technician Grade III- Matriculation / SSLC plus ITI from recognized institutions of NCVT/SCVT in relevant trade.